Every variety of magnifier, eye loupe, and inspection mirror, including Optivisor products. Pocket & table magnifiers. Economy head magnifiers. 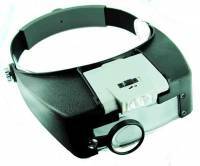 Head magnifiers, auxiliary lens, headbands, etc. Description: Plastic body with 22mm plastic lens. Collapses from 7/8” height to 5/16”. Comes in a plastic storage box. India. Description: 21mm lens. With LED light. Push switch to turn on/off. Operates on 3 cell batteries, included. In a protective plastic case. Description: 5-piece plastic loupe assortment: 2.5X, 3X, 5X, 7X and 10X. India. 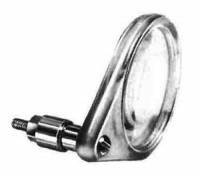 Description: Spring loaded clamp holds loupe on glasses. 24mm glass lens with aluminum body. Adjustable length. Each lens is 10X for a total magnification of 20X. Pivoting loupe clips on either side of your glasses. China. 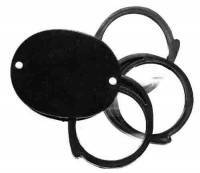 Description: Spring loaded clamp holds loupe on glasses. 22mm glass lens with aluminum body. Adjustable length. Each lens is 3.3X for a total magnification of 9.9X. Pivoting loupe clips on either side of your glasses. China. 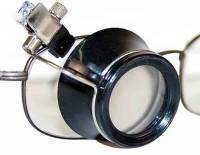 Description: 2.5X, 5X, 7.5X and 10X loupes with 22mm (7/8") glass lens diameter. In a plastic storage container. China. Description: Spring loaded clamp holds loupe on glasses. 24mm glass lens with aluminum body. Adjustable length. Each lens is 5.0X for a total magnification of 10.0X. Pivoting loupe clips on either side of your glasses. China. 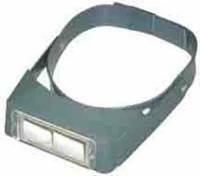 Description: Spring loaded clamp holds loupe on glasses. 24mm glass lens with aluminum body. Adjustable length. Each lens is 7.5X for a total magnification of 15X. Pivoting loupe clips on either side of your glasses. China. 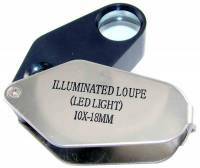 Description: Consists of 1 each of 2x (#23450), 5x (#16576), & 10x (#18437) flip-up loupes. Clips right over glasses, either side. Description: Clips onto your glasses. India. 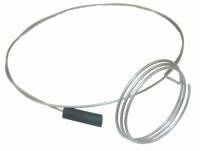 Description: Spring wire band holds individual plastic & aluminum loupes in place. Made in India. Description: 6-3/4" tall 12-LED lamp is great for your work area. Black & silver plastic body. Adjustable pivoting neck directs bright light where you need it. Requires 3-AA batteries, not included. On/off switch. China. 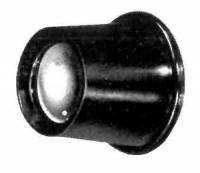 Description: Economical 1-1/8" diameter plastic lens is 2x power. Attach to your binocular magnifier for more power. Made in India. Description: 18mm lens. With LED light. Push switch to turn on/off. Operates on 3 cell batteries, included. In a protective plastic case. 10X. Description: 120 Lumen 6-SMD LED bulbs. Adjustable head strap. Silver & black plastic body. 3 stage switch Low/Hi/Blink. Batteries are included. China. Description: Imported, economical clip-on eye loupe with 10X can be used on either side. Description: Imported, economical clip-on eye loupe with 5X can be used on either side. Description: 2 lenses total 10X. Made in India. Description: 2 lenses total 15x. Made in India. Description: 10X/36 diopters adjustable loupes mounted in black plastic eyeglass frames. Adjustable LED bulb illuminates viewing area operates on 2 cell batteries, included. China. Description: Black plastic eye loupe with a ground plastic 4X lens. Made in India. Combine with other sizes for price break. Description: 1-3/4X lens only for Optivisor units. 14" working distance. #3 lens. Made in the USA. Description: 6-1/2" long aluminum inspection mirror has a 7/8" diameter mirror. Made in India. Description: 2-1/2X lens only for Optivisor units. 8" working distance. #5 lens. Made in the USA. Description: Triple magnifier has 3 swing-out lenses totalling 10X. Made in India. Description: 2-3/4X lens only for Optivisor units. 6" working distance. #7 lens. Made in the USA. Description: Complete Optivisor headset without a lens. Made in the USA. Description: 3-1/2X lens only for Optivisor units. 4" working distance. #10 lens. Made in the USA. Description: Deluxe 2-3/4X Optivisor has a working distance of 6" and an adjustable padded headband. The polished and ground prismatic glass lens can pivot out of the way. Fits over glasses. Made in the USA. Description: 2X lens only for Optivisor units. 10" working distance. #4 lens. Made in the USA. Description: Imported, economical clip-on eye loupe with 3.3X can be used on either side. Description: Imported plastic eye loupe with a ground glass 5X lens. Combine with other sizes for price break. Description: Ultra light 5x precision ground plastic loupe pivots out of the way when not in use. Changeable cams fit a variety of frames. Made in USA by Donegan. Description: Imported plastic eye loupe with a ground glass 7.5X lens. Combine with other sizes for price break. Description: Ultra light 3x precision ground plastic loupe pivots out of the way when not in use. Changeable cams fit a variety of frames. Made in USA by Donegan. Description: Imported plastic eye loupe with a ground glass 10X lens. Combine with other sizes for price break. Description: Ultra light precision ground plastic loupe pivots out of the way when not in use. Double lens: one is 4x the other is 7x. Use individually or together. Changeable cams fit a variety of frames. Made in USA by Donegan. Description: Spring loaded clamp holds loupe on glasses. 24mm glass lens with aluminum body. Adjustable length. Each lens is 3.3X for a total magnification of 6.6X. Pivoting loupe clips on either side of your glasses. China. Description: Replacement headband for all Optivisors. Description: Deluxe 1-3/4X Optivisor has a working distance of 14" and an adjustable padded headband. The polished and ground prismatic glass lens can pivot out of the way. Fits over glasses. Made in the USA. Description: Deluxe 2X Optivisor has a working distance of 10" and an adjustable padded headband. The polished and ground prismatic glass lens can pivot out of the way. Fits over glasses. Made in the USA. Description: Deluxe 2-1/2X Optivisor has a working distance of 8" and an adjustable padded headband. The polished and ground prismatic glass lens can pivot out of the way. Fits over glasses. Made in the USA. Description: Black plastic eye loupe with a ground plastic 3X lens. Made in India. Combine with other sizes for price break. Description: 2-1/2X Optiloupe fits on either side of an Optivisor to provide additional power. Description: Black plastic eye loupe with a ground plastic 3-1/2x lens. Made in India. Combine with other sizes for price break. 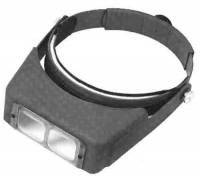 Description: Deluxe 3-1/2X Optivisor has a working distance of 4" and an adjustable padded headband. The polished and ground prismatic glass lens can pivot out of the way. Fits over glasses. Made in the USA. Description: 10X triplet diamond loupe is highly corrected for spherical and chromatic aberrations. Black anodized metal body in a leather case. India.